Open-ended questions include those such as “What do you think about putting all the managers on an intranet?” “Please explain how you make a scheduling decision.” “In what ways does the system extend your capability to do tasks that would not be possible otherwise?” Consider the term open-ended. “Open” actually describes the interviewee’s options for responding. They are open. The response can be two words or two paragraphs. Some examples of open-ended questions are shown below. What’s your opinion of the current state of business-to-business ecommerce in your firm? What are the critical objectives of your department? Once the data are submitted via the Web site, how are they processed? Describe the monitoring process that is available online. What are some of the common data entry errors made in this department? What are the biggest frustrations you’ve experienced during the transition to ecommerce? Open-ended interview questions allow the respondent open options for responding. The examples were selected from different interviews and are not shown in any particular order. Putting the interviewee at ease. Allowing the interviewer to pick up on the interviewee’s vocabulary, which reflects his or her education, values, attitudes, and beliefs. Revealing avenues of further questioning that may have gone untapped. Making it more interesting for the interviewee. Making phrasing easier for the interviewer. Using them in a pinch if the interviewer is caught unprepared. Asking questions that may result in too much irrelevant detail. Possibly losing control of the interview. Allowing responses that may take too much time for the amount of useful information gained. Potentially seeming that the interviewer is unprepared. Possibly giving the impression that the interviewer is on a “fishing expedition” with no real objective for the interview. You must carefully consider the implications of using open-ended questions for interviewing. The alternative to open-ended questions is found in the other basic question type: closed questions. Such questions are of the basic form “Is it easy to use the current system?” and, “How many subordinates do you have?” The possible responses are closed to the interviewee, because he or she can only reply with a finite number such as “None,” “One,” or “Fifteen.” Some examples of closed questions are listed below. How many times a week is the project repository updated? On average, how many calls does the call center receive monthly? Which of the following sources of information is most valuable to you? List your top two priorities for improving the technology infrastructure. Closed interview questions limit the respondent’s options. The examples were selected from different interviews and are not shown in any particular order. A closed question limits the response available to the interviewee. You may be familiar with closed questions through multiple-choice exams in college. You are given a question and five responses, but you are not allowed to write down your own response and still be counted as having correctly answered the question. A special kind of closed question is the bipolar question. This type of question limits the interviewee even further by only allowing a choice on either pole, such as yes or no, true or false, agree or disagree. Examples of bipolar questions are listed below. Do you use the Web to provide information to vendors? Do you agree or disagree that ecommerce on the Web lacks security? Do you want to receive a printout of your account status every month? Does your Web site maintain a FAQ page for employees with payroll questions? Bipolar interview questions are a special kind of closed question. The examples were selected from different interviews and are not shown in any particular order. Keeping control over the interview. Covering lots of ground quickly. Being boring for the interviewee. Failing to obtain rich detail (because the interviewer supplies the frame of reference for the interviewee). Missing main ideas for the preceding reason. Failing to build rapport between interviewer and interviewee. 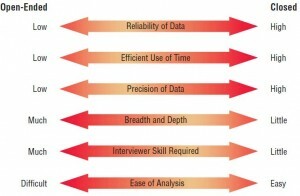 Thus, as the interviewer, you must think carefully about the question types you will use. Both open-ended and closed questions have advantages and drawbacks, as shown in the figure below. Notice that choosing one question type over the other actually involves a trade-off; although an open-ended question affords breadth and depth of reply, responses to open-ended questions are difficult to analyze. Attributes of open-ended and closed questions. A third type of question is the probe or follow-up. The strongest probe is the simplest: the question, “Why?” Other probes are “Can you give me an example of a time you did not find the system trustworthy?” and “Will you elaborate on that for me?” Some examples of probing questions are listed below. The purpose of the probe is to go beyond the initial answer to get more meaning, to clarify, and to draw out and expand on the interviewee’s point. Probes may be either open-ended or closed questions. Give an example of how ecommerce has been integrated into your business processes. Please give an illustration of the security problems you are experiencing with your online bill payment system. You mentioned both an intranet and an extranet solution. Please give an example of how you think each differs. Tell me step by step what happens after a customer clicks the “Submit” button on the Web registration form. Probes allow the systems analyst to follow up on questions to get more detailed responses. The examples were selected from different interviews and are not shown in any particular order. It is essential to probe. Most beginning interviewers are reticent about probing and consequently accept superficial answers. They are usually grateful that employees have granted interviews and feel somewhat obligated to accept unqualified statements politely.